In the Napoleon courtyard at the Louvre Museum, the famous Pyramid points towards the heavens. But, underneath it has a bit of a surprise in store. The Carrousel du Louvre is a unique site for shopping, leisure activities and exhibitions in the very centre of Paris! The shopping centre includes 45 shops and at its centre nestles the Pyramide Inversée (Inverted Pyramid), weighing 180 tons and 7 metres in height. There are 4 exhibition halls and for the peckish visitors, the variety of the “Restaurants du Monde”. The assortment of shops and brands on offer entice visitors deeper and deeper into the Carrousel: cakes and chocolates, beauty products, jewellery, gifts, toys, fashion, furniture and decoration, etc., with the well-known brands of La Maison du Chocolat, Fragonard, Swatch, Swarowski, Le Printemps, Lancel, Lacoste, Nature et Découvertes and many more, all joining the fray. To enjoy your visit to the full, make sure you book your space in advance in a nearby car park. Get the best deals on our website! 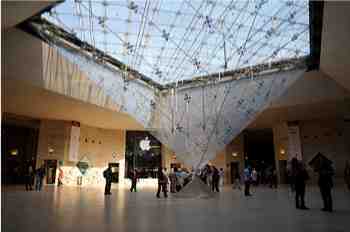 The Carrousel du Louvre was opened in October 1993. During the construction work, which lasted two and a half years, the “Charles V” walls, the town’s 14th century fortifications, were uncovered by archaeologists. These defensive walls have been preserved and now surround the “Hall Charles V". Historic elements and precious materials of impressive size have been combined to create this lavish shopping experience. It measures 275 metres in length and covers an impressive 25,000 m². Before or after your visit to the Louvre, give in to the temptation to scratch the shopping itch, you won’t regret it! Now, here’s a little insider tip! If the queue at the main entrance of the Louvre is too big, pop on down through The Carrousel du Louvre, where you’ll find an entrance point to the Louvre Museum, at a fraction of the waiting time! And the best part is that you’ll enter the exact same part of the Louvre as the people who had waited at the much longer line!